After posting the Napoletana Pizza Dough recipe, I just had to follow up with my favorite way to use it. 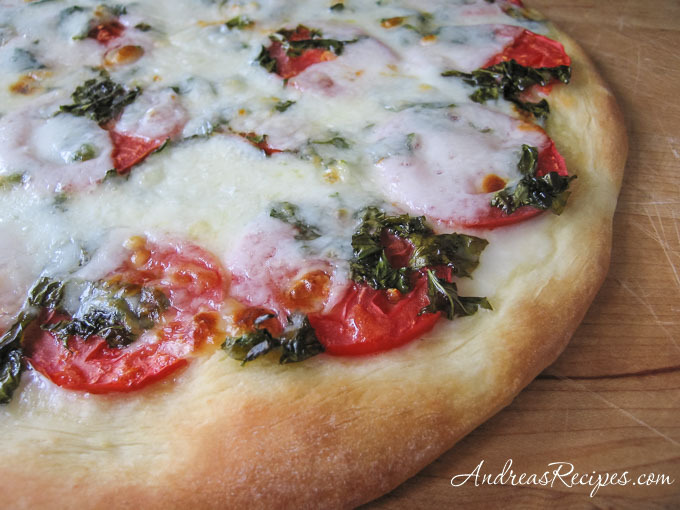 Our basil and tomatoes are coming in like crazy, and this is certainly a tasty and easy way to enjoy our garden bounty. You just layer on sliced tomatoes and chopped basil, sprinkle on some olive oil, and then top with sliced fresh mozzarella. If you want to get adventurous, throw on some minced garlic. The idea is to keep it simple and allow the flavors of the fresh ingredients to shine. I like the cheese to melt a bit in the oven, so I put it on before baking, but you can also reserve the cheese until the pizza is out of the oven and then lay it on top, which will soften it just a bit before slicing. Sounds and looks great. I would have to include the garlic myself. Garlic makes almost anything taste better. Wow, I am pretty well known for my pizza but I like the looks of this. It looks like a pizza two could enjoy on romantic summer evening! I look forward to trying this (and the homemeade napolean dough). I do something very similar, though I soak the tomatoes in balsamic vinegar for a few minutes, and I brush garlic olive oil on the crust before I put down the tomatoes.